Congratulations to all the students who participated in the 2018 Australian History Competition. In 2018 we had entries from across all sectors in metropolitan, rural and remote schools. A full list of winners is available on the Australian History Challenge website. 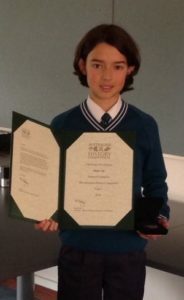 Picture: Oscar Lin Geraldton Grammar is National Champion for Year 7.